Artist's illustration of China's planned communications spacecraft, which will relay data between controllers on Earth and the Chang'e 4 lander and rover on the moon's far side. 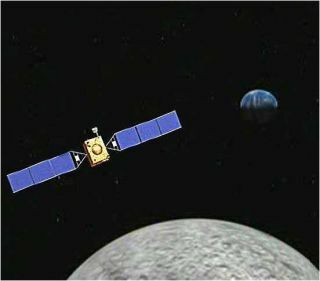 China is pressing forward on its Chang’e 4 lunar probe, which is scheduled to be launched in the latter half of this year. The spacecraft will attempt the first-ever soft landing on the far side of the moon. As a prelude to the mission, China is set to launch a relay satellite in the first half of 2018. This communications craft will be positioned at the Earth-moon Lagrange point 2 (EM-L2), China's state-run Xinhua news service has reported. This EM-L2 locale will allow the satellite to relay data between controllers here on Earth and the Chang'e 4 lander and rover on the moon's far side. Meanwhile, China is soliciting 20,000 messages that will be sent into space via the relay satellite. "People all over the world can follow the WeChat account 'slecbj' to submit their wishes from Dec. 19, 2017, to March 6, 2018," Xinhua reported.